The world learned today of the latest in a seemingly never-ending series of coordinated terrorist attacks, this time a trio of deadly explosions at an airport and a subway station in Brussels, Belgium, a city that had already been on edge for months. ISIS has claimed responsibility for these attacks, which have already killed 30 people, with 230 others injured. Increasingly, social media sites like Twitter have become sounding boards for those affected by large-scale tragedies, and Brussels is no exception. Hashtags such as #PrayForBruxelles and #JeSuisBruxelles have been widely circulating today, generating thousands of messages of support from around the world. Among these are numerous works of art from painters and cartoonists. They take many forms. Some are satirical, others somber. 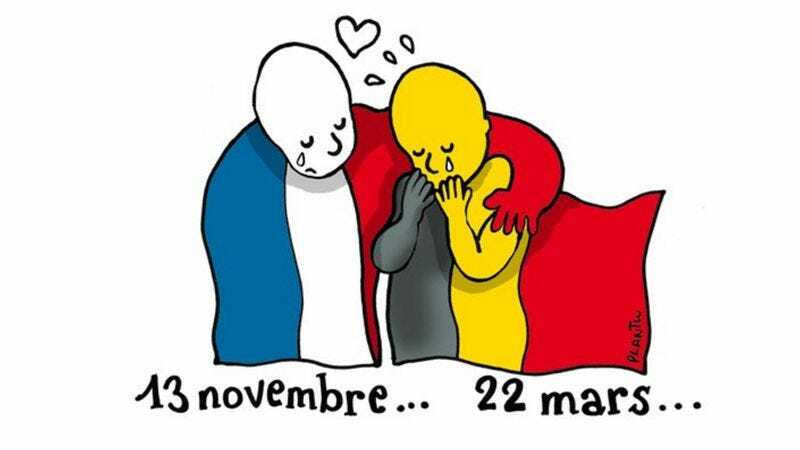 French cartoonist Jean “Plantu” Planteureux created a simple, moving image for Le Monde that ties the attacks in Brussels to those last November in Paris. Multiple tweets invoked the Belgian cartoon character Tin Tin. Others expressed an understandable fatigue for stories of this nature, seeing as how there seems to be no end to the bleak headlines. Still others drew upon the image of Manneken Pis, Belgium’s famous urinating statue created by Jerome Duquesnoy. The iconic work of art has been a symbol of Brussels for 400 years and remains a popular tourist attraction to this day. In the view of one artist, the statue pees on a gun as a symbolic denunciation of violence. In the view of another, the boy simply hangs his bronze head and sobs for what his city has lost.